The Institute of Chartered Accountants of India (ICAI) has organized the examination of CA final Nov 2018 in the month of November. The result of CA final exam has been announced on the 23rd of January 2019 around 5 pm. The result of CA Final will get announced along with that of CPT and CA Foundation Result . ICAI also released ca final nov 2018 toppers press release containing the list of All India Rankers of CA final nov 2018 old and new syllabus. 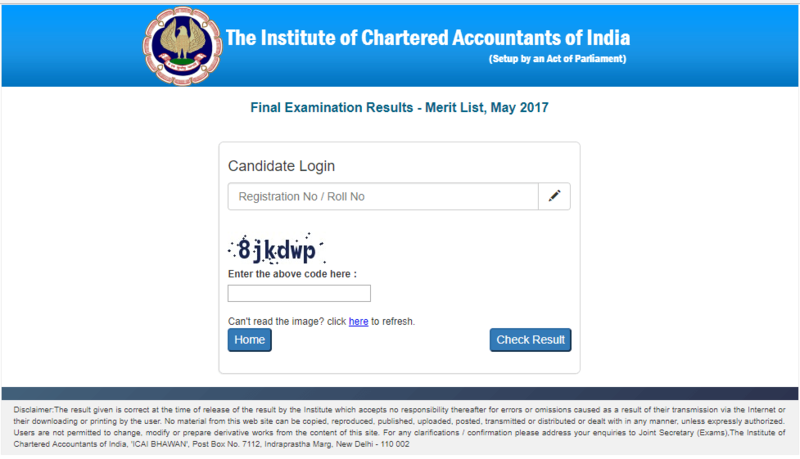 The result was announced on the ICAI official website. But you can check the same from the given page also. Here we have not only provided the link to download your result but also mentioned the complete stepwise procedure to check it. Read Below the complete announcement. To become a Chartered Accountant, a student is required to obtain at least 50% marks in aggregate of all the subjects and 40% marks in each individual subject. Here you can see your CA Final result in both online and offline modes along with the pass percentage, toppers list, and their marks. Follow these steps to see your result easily. Click here or Here and land on the official website. Under the Check, Results section find CA Final result 2018 link. This link will land you on CA final result for May 2019 attempt. Enter your CA Final roll no. along with Registration no. or PIN then clicks on submit. To find your 2018 CA Final result, you have multiple options. You can check your result online or you can get it offline. You can see your CA Final result directly from the above-given link or you can opt for SMS or Email facility. If you want your CA final May 2019 result through SMS or Email here are all the processes you need to follow. Your Registration number or PIN No. The links given below will show zone-wise ICAI CA Final result 2018. The links will become active after ICAI releasing.